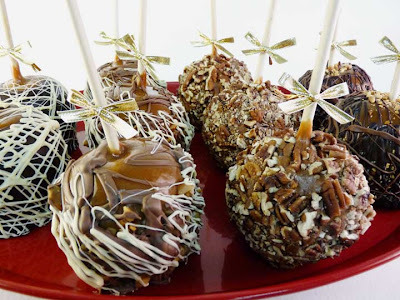 It's Gourmet Caramel Apple Time! Well, it's fall and you know what that means? Local apples are in season and suitable for dunking into caramel, nuts, and chocolate! We offer a number of variations as the season gets into full swing. Last year's most adventurous offering was covered in graham cracker crumbs and tiny marshmallows for a S'mores creation. The apples in the picture above are (from left to right) Double-Chocolate Caramel, Butter Crunch, Milk Chocolate Toasted Pecan, and Dark Chocolate Peanut. So you can be more than sure when you get one from The Hot Chocolatier, it will be from a local orchard, fresh, and loaded with goodness!